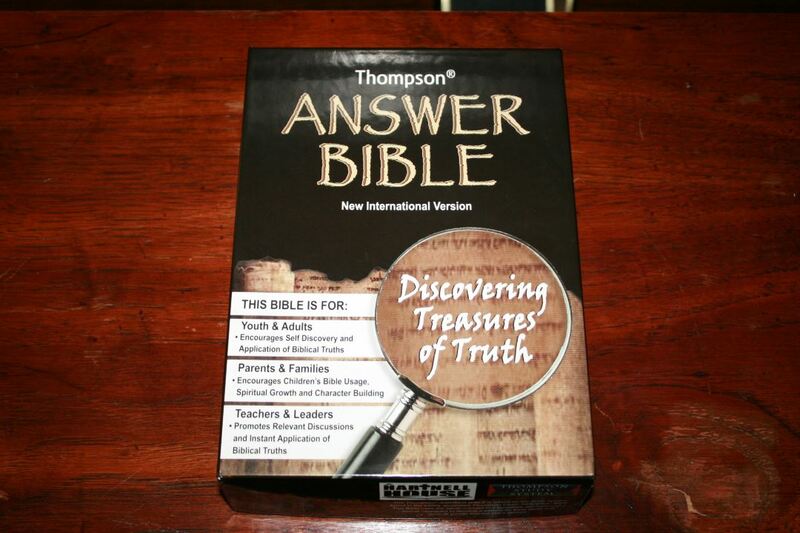 A collaborative work by Kirkbride and Hartnell House, the Thompson Answer Bible was designed to help you find answers for everyday issues from the Thompson Chain study system. 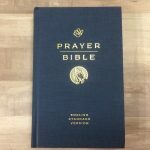 It includes 500 topics with questions, Scripture references, and applications. The target audience is children and is for use by youths, adults, parents, families, teachers, and leaders. I’m reviewing ISBN: 9781936119110. 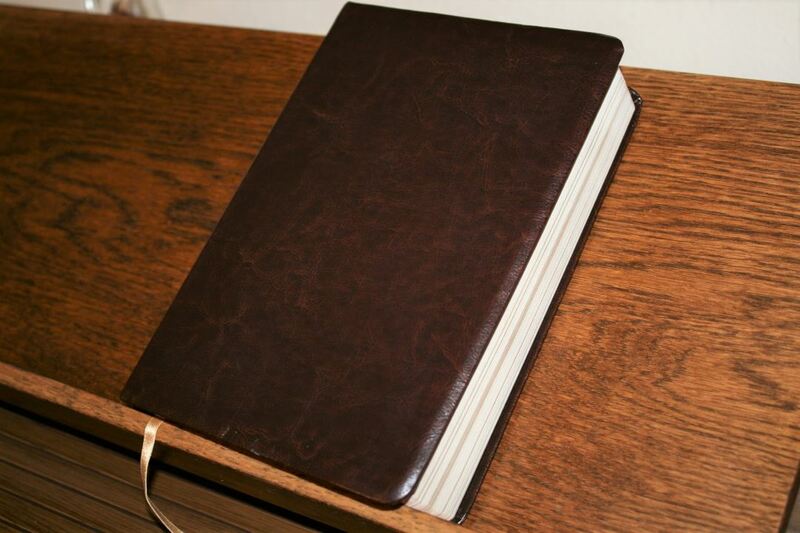 The cover is brown imitation leather. It has an excellent look and feel. I love the color and texture. 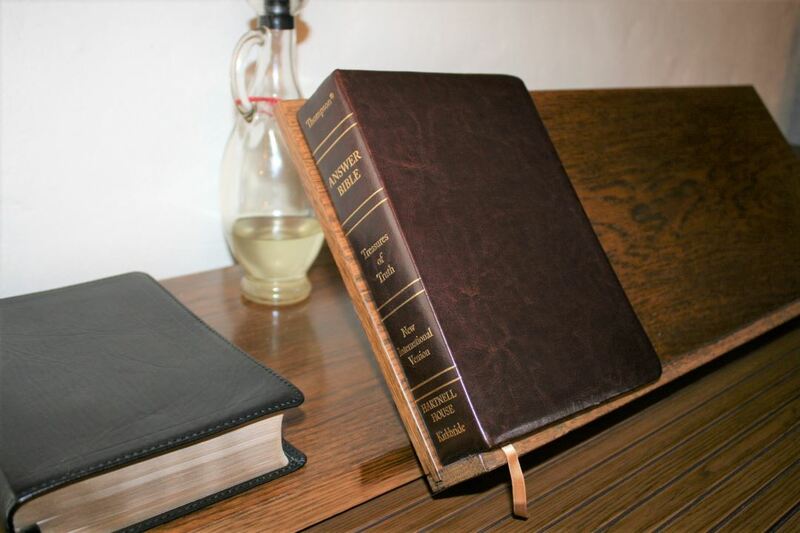 I’m not overly fond of imitation leather but if I have a Bible with imitation leather this is the style that I like the most. It includes a matching brown paste-down liner and is Smyth sewn. 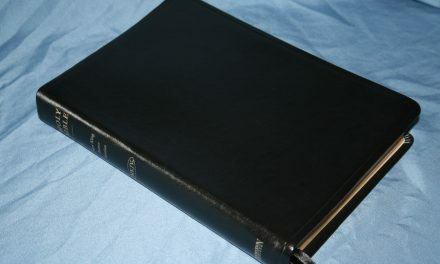 It lays open in Genesis with no problems and the way the spine bends upward when opened makes the pages lay extremely flat, almost making the gutter disappear. 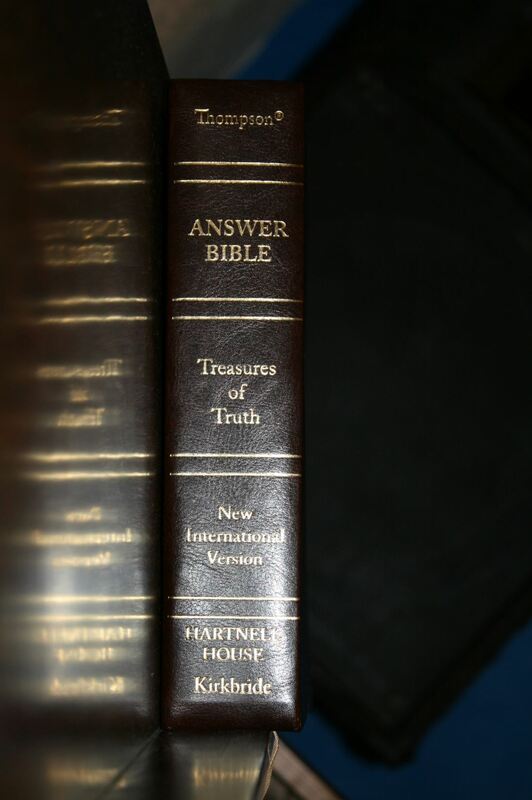 The spine shows the branding information in gold text. Each section has gold double-line separators. The overall size is 8.75 x 6.125 x 1.75”. The gold ribbon is long enough to pull to the corner and have some left over. It matches the brown and gold head/tail bands perfectly and they all look great against the brown cover. The paper feels like mid 30’s for GSM. It’s white and decently opaque. A little more opacity would greatly improve readability but this is still usable. It does have a little glare under direct lighting but it isn’t as bad as a standard Thompson and is only a minor complaint. For most uses it would be fine. I had no issues turning pages. Like the regular Thompson the paper is noisy when turning pages. The text is presented in single-column paragraph with bold section headings. Poetry is set to stanzas. 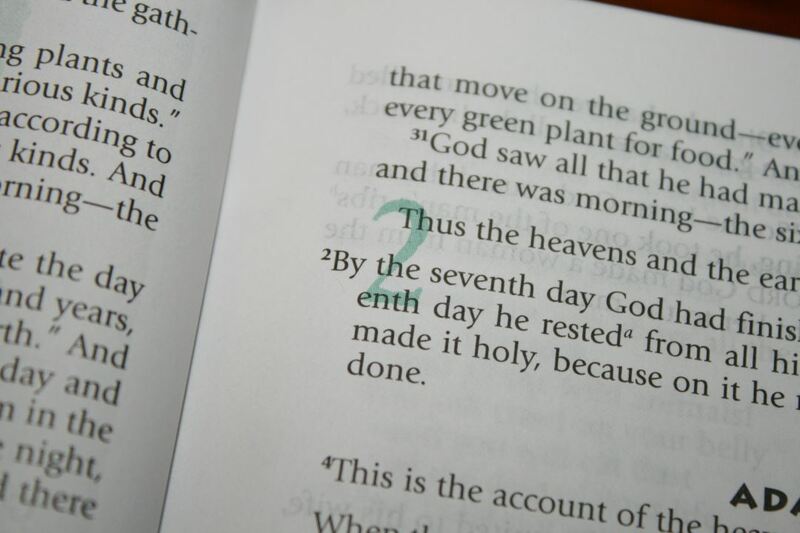 The header shows the book name and chapter number in light green. 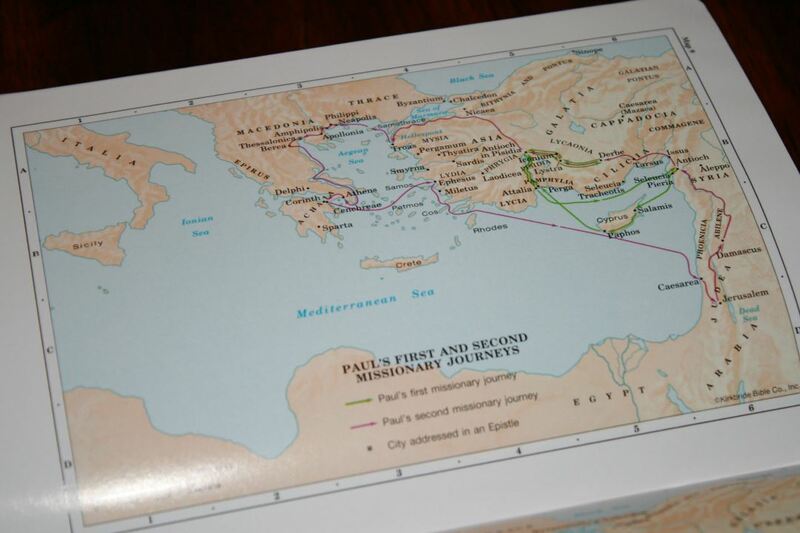 Footnotes are in the footer and page numbers are in the bottom outer corners. 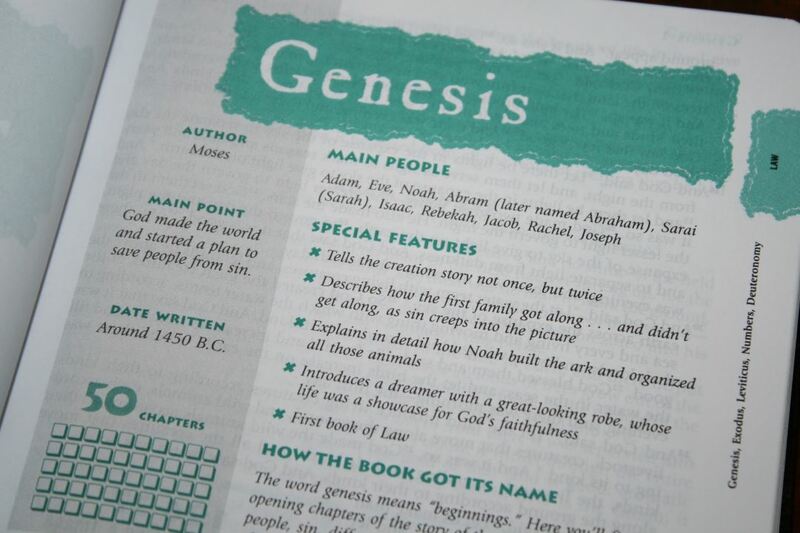 The font style for everything but Scripture is designed to appeal to children. The font is 9-point black letter with a generous leading. It’s about a medium darkness and is highly readable and consistent throughout. There aren’t a lot of distractions in the text. Footnote keys are small enough to ignore easily. Verse numbers are larger but they didn’t get in the way of my reading. I also found them easy enough to find. It has around 78 characters across with around 14 words per line. And around 51 lines per page. 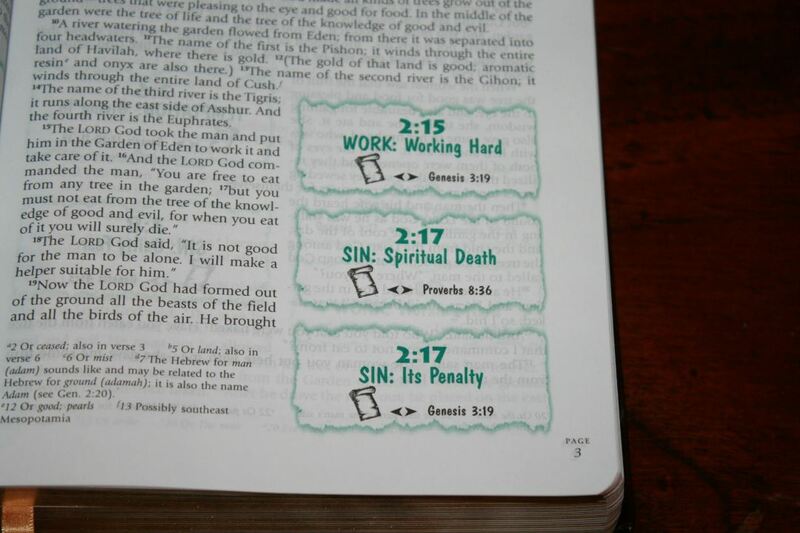 Chapter numbers take over three lines and are in light green. The text is printed over them. This is an interesting visual that keeps the line-length consistent while still providing the chapter numbers. 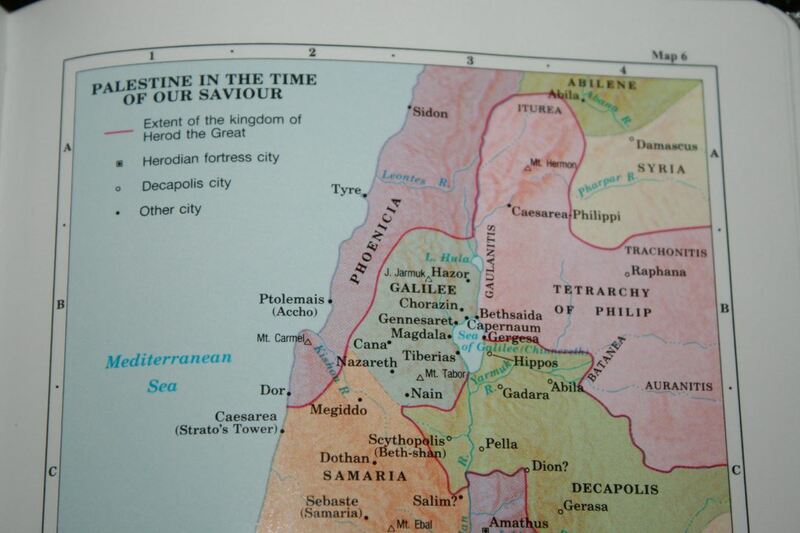 The reference system is placed to the right of the text. In the standard paragraph format the text wraps around the references. The poetic settings usually have enough line-width to not be affected by the references. References are contained within light green boxes. 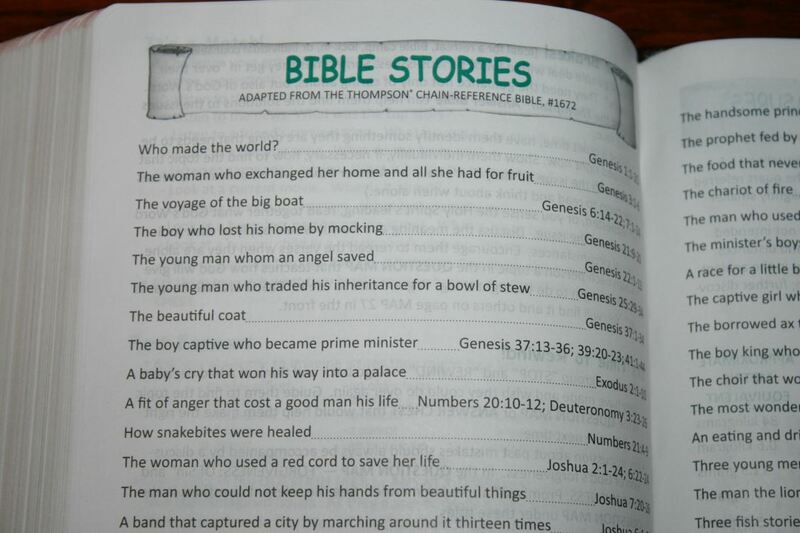 They include the verse number, topic, and previous and next verses. They are based on the Thompson Chain Reference system. 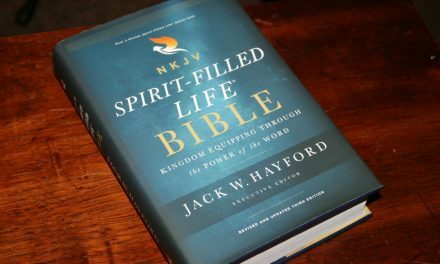 There aren’t as many references as the regular edition, but this Bible is focused on giving answers to life’s questions, so that makes sense. 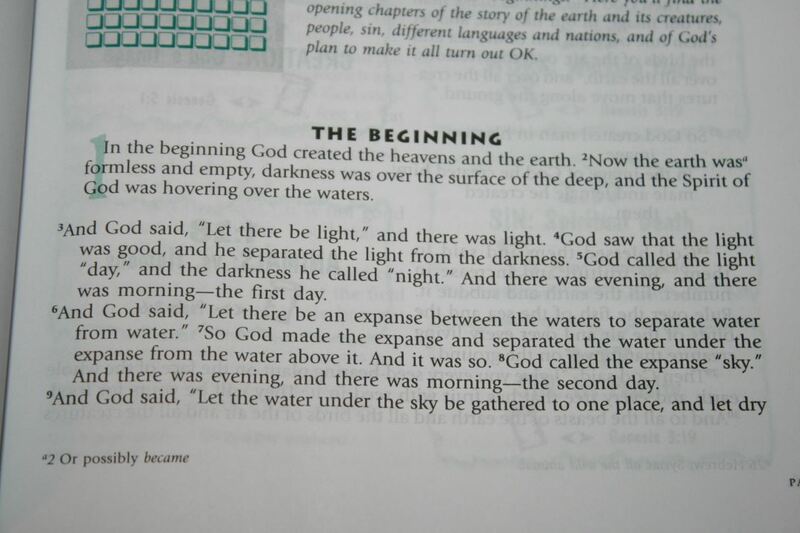 Genesis 1:26-27, 5:1, 9:6, 1 Cor 11:7, Jm 3:9. The same topic is found in the front and back. The complete chain is found in the back in the Answer Chest. The Thompson topic number isn’t given within the text but it is given in the back. I like that the chains go in both directions. 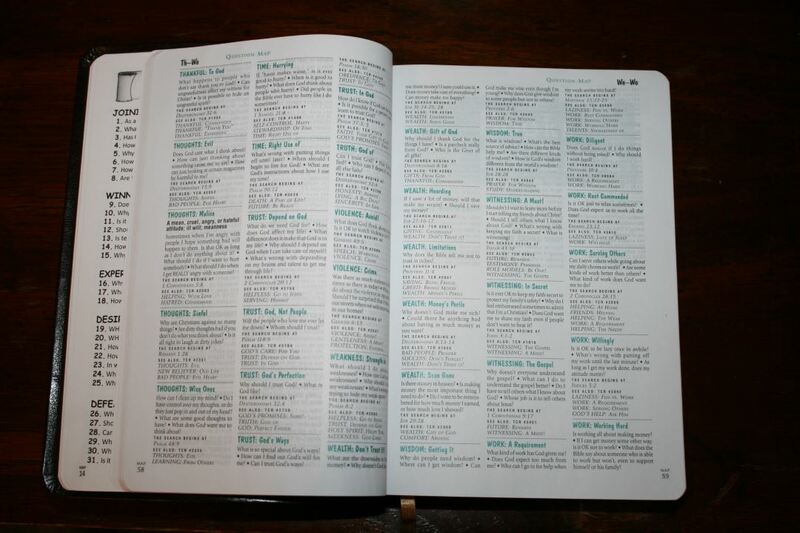 This lets you start where you are and easily find all of the verses without having to go to the index in the back to find it. 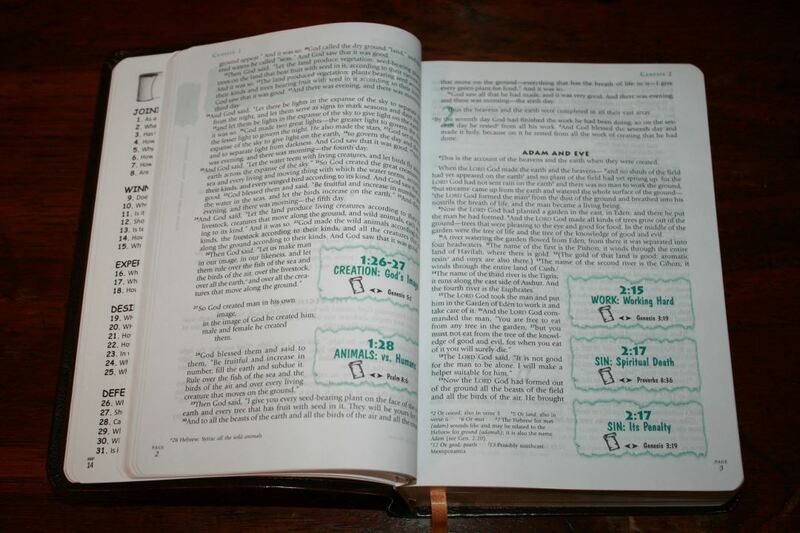 The standard NIV footnotes are included. They’re keyed to the text with letters. 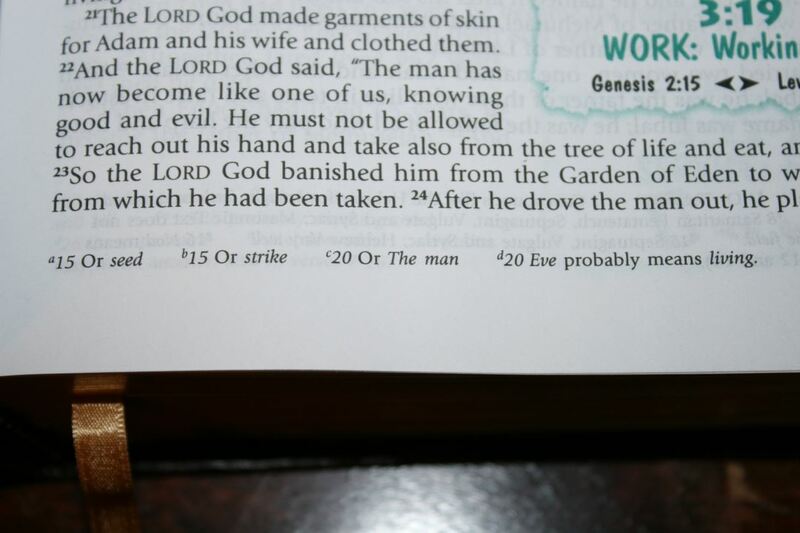 The footnote gives the verse number and reference key. 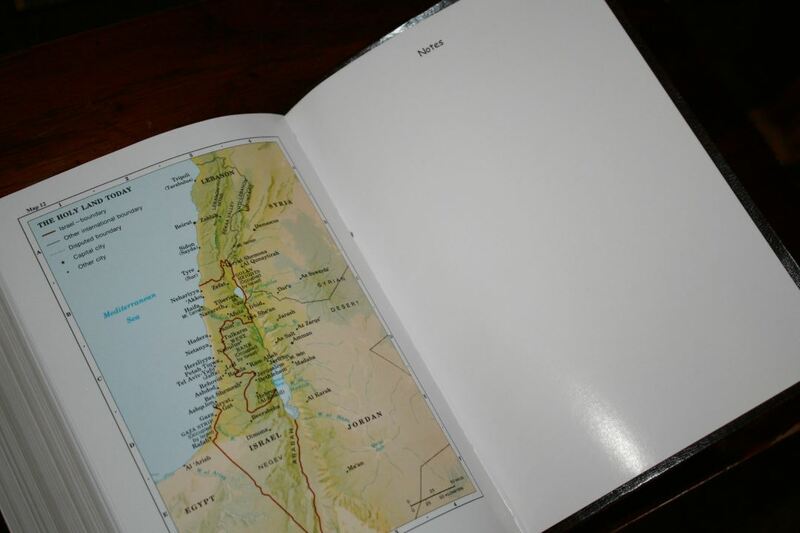 They include information about people, Greek and Hebrew words, weights and measures, where something is quoted from, alternate names, meaning of names, alternate renderings, etc. The footnotes are great for shedding light on the translation and translator’s thought-process. Book introductions include the author, main point, date written, main people, special features, how it got its name, and a checkbox for each chapter to mark as you read. They’re short and simple but still give the needed information. 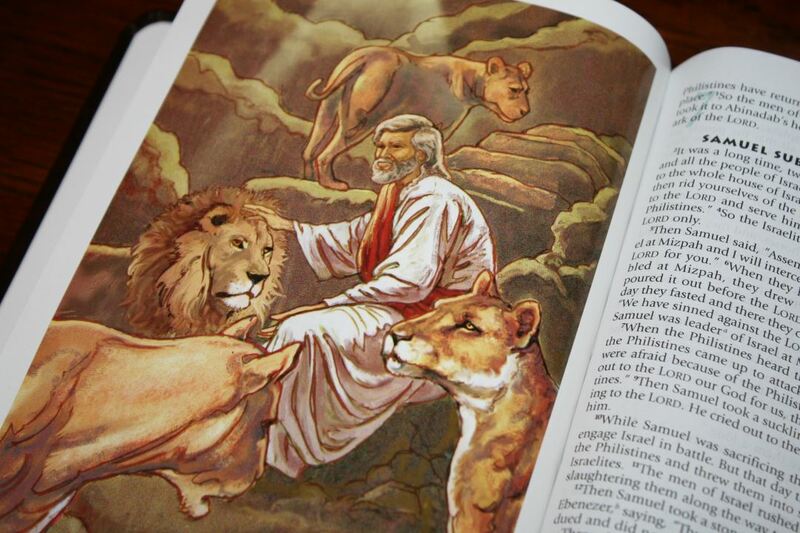 There are lots of comic book-style artwork printed on thick glossy paper in sections throughout the Bible. Each drawing includes Scriptures with references at the bottom. 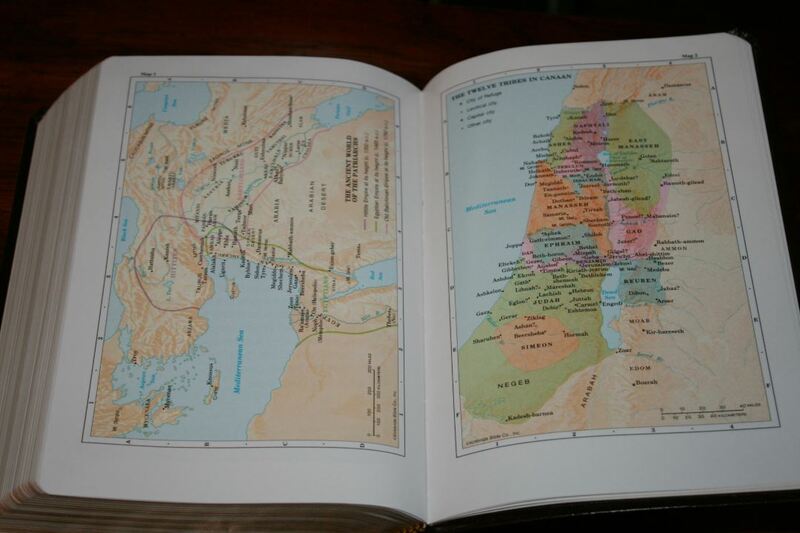 The subject is from the surrounding books or sections. 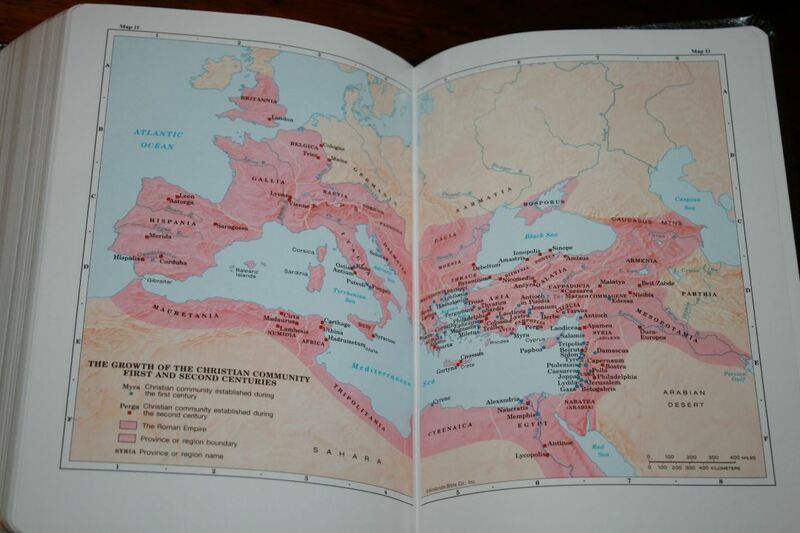 The drawings are well-drawn and look great. I love biblical artwork and I’m glad they’ve included it. Artwork helps visualize the settings. 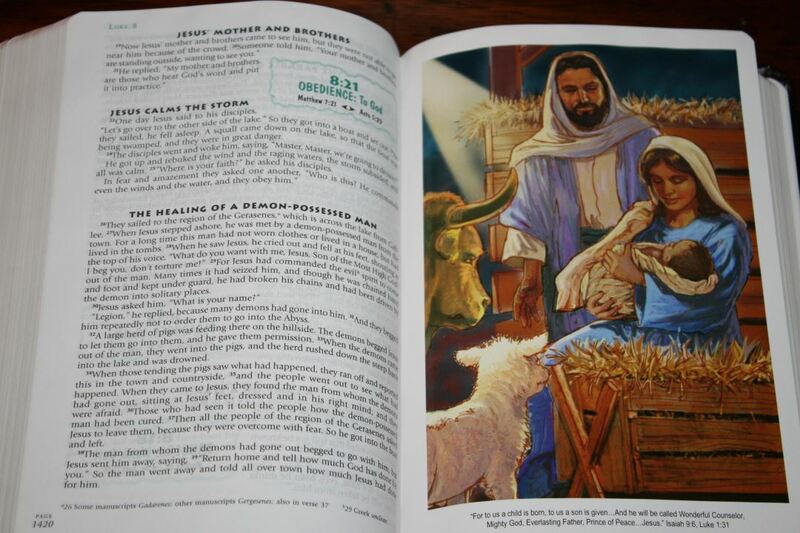 I’d love to see more Bibles include artwork. 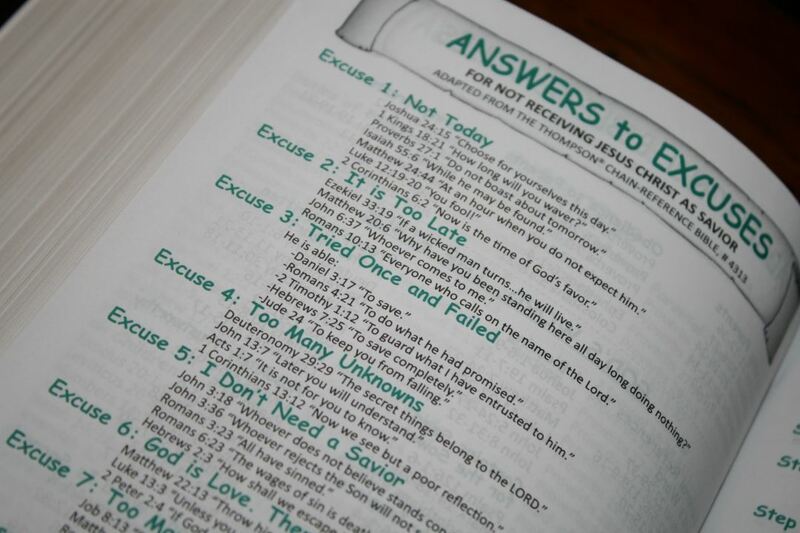 The Questions and Answers are the index to the topics within the text. 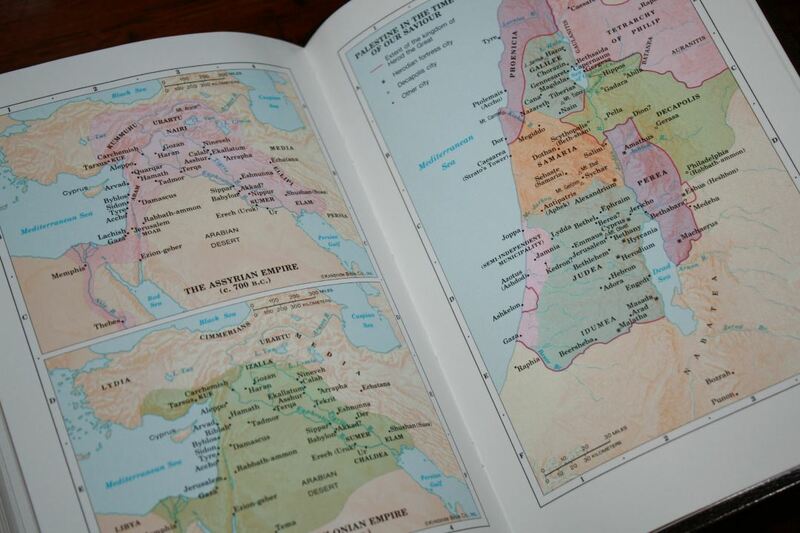 This is similar to the index in a standard Thompson and is part of what makes this Bible a topical Study Bible. In the front are the topical questions. Daily Treasures of Truth is a daily devotional reading that breaks the reading up into topics and asks a question. 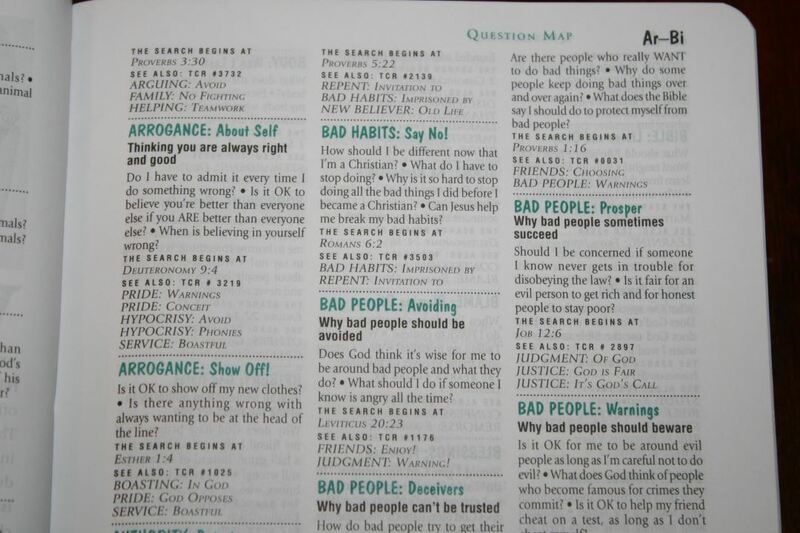 Instead of giving you the answers, you’ll discover the answers by reading the verses for the topics in the Question Map. 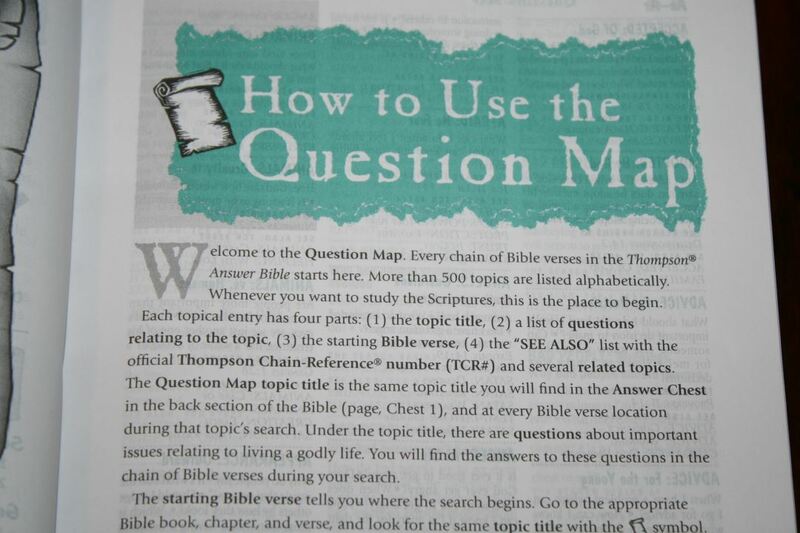 The Question Map contains all of the chains with a topic title, list of questions pertaining to the topic, the first verse, the Thompson chain number, and a list of related topics. 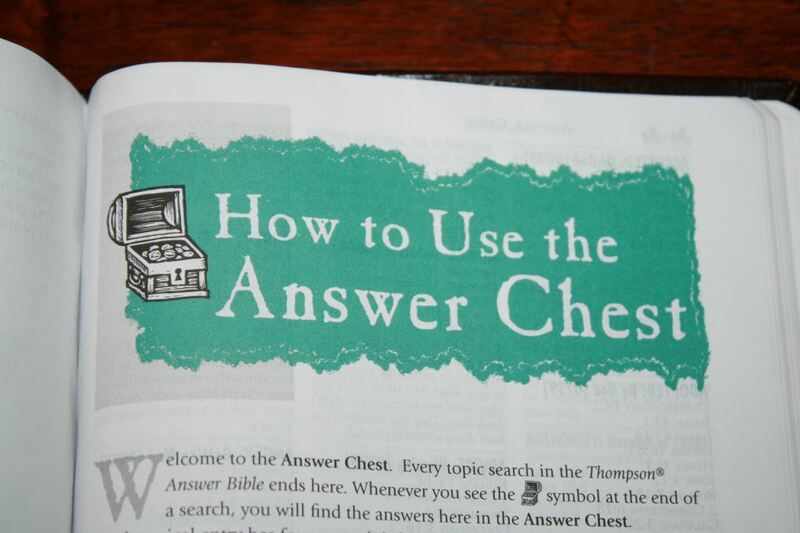 The topic titles are also found in the Answer Chest in the back. The focus of the questions is about daily life. Rather than giving you the answers or telling you what to believe it lets Scripture teach you. One thing I appreciated is the instructions tell you not to just take the verse by itself but to read the surrounding verses to understand the context. 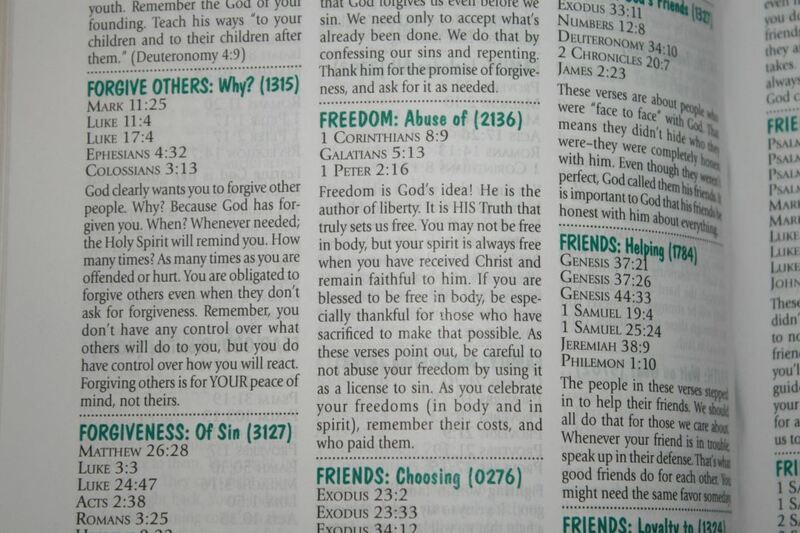 Another article in the front gives advice on how to study the Bible. 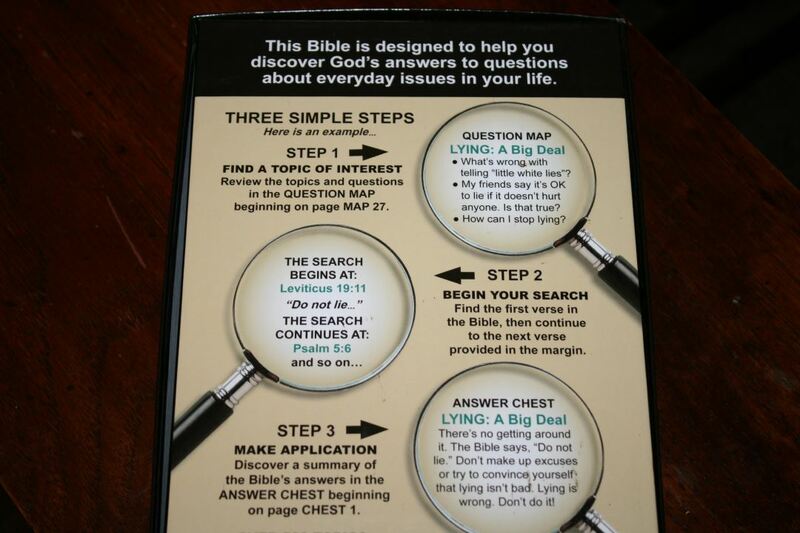 The Answer Chest is in the back and includes all of the topics from the Question Map. 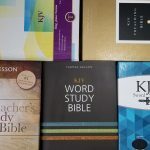 They include the topic title, Thompson Chain Reference number, the list of verses in the topic, and a short summary with application. Several topics include subtopics. 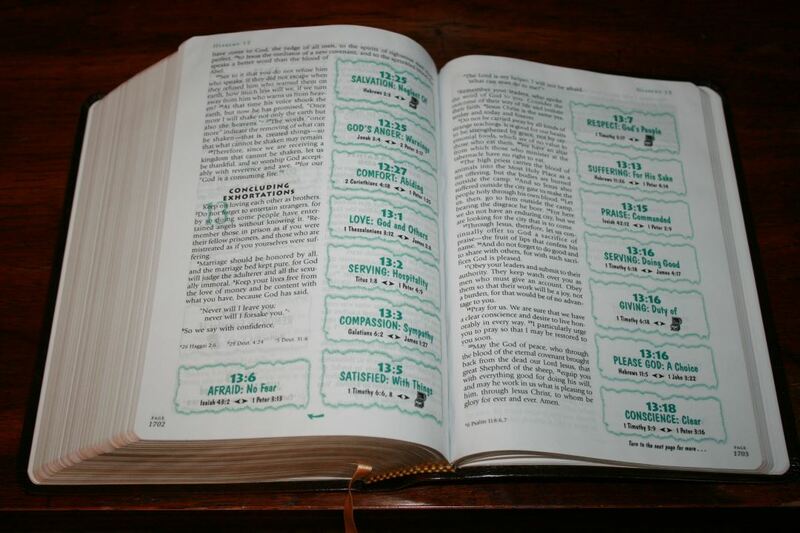 For example, the topic for God has 21 subtopics and the topic for Jesus has 13 subtopics. 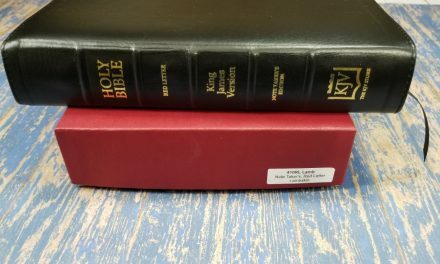 The summaries are more factual based rather than theological based, which I appreciate because it gives readers the tools to do their own study. There are several other resources to help with study. 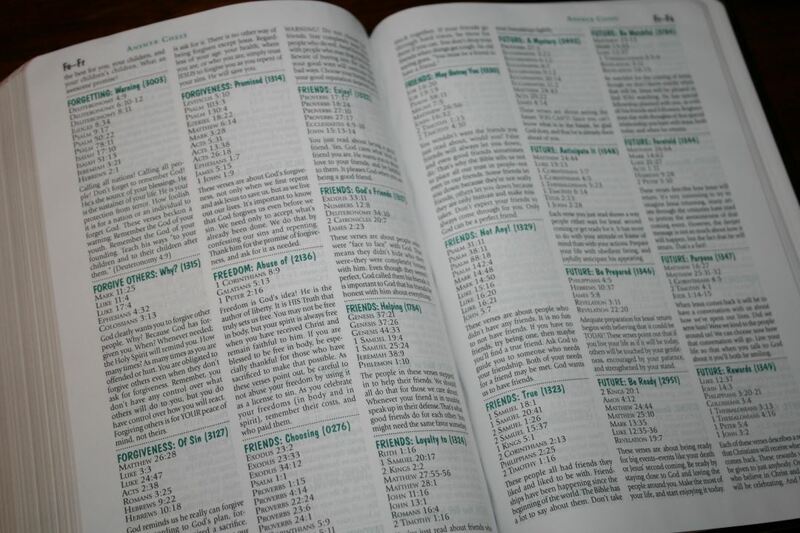 These are mostly lists of Scriptures. A few are activities for parents and teachers to use with children. 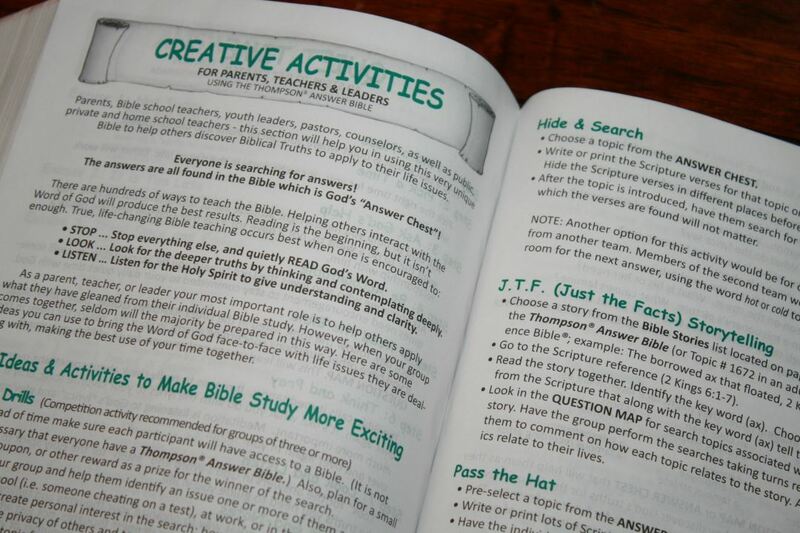 The Thompson Answer Bible uses a portion of the Thompson Chain Reference system to provide a study Bible for children that uses Scripture to give them the answers they need about daily life. 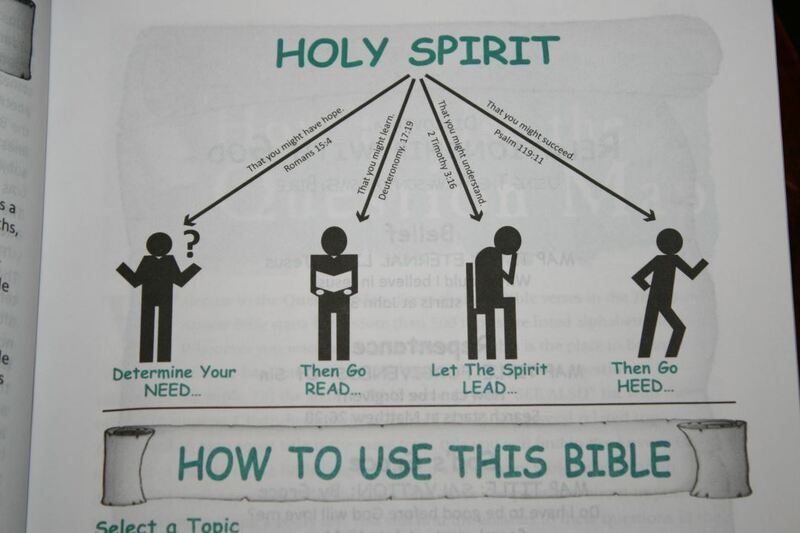 I prefer this method to study Bibles that mostly use commentary. 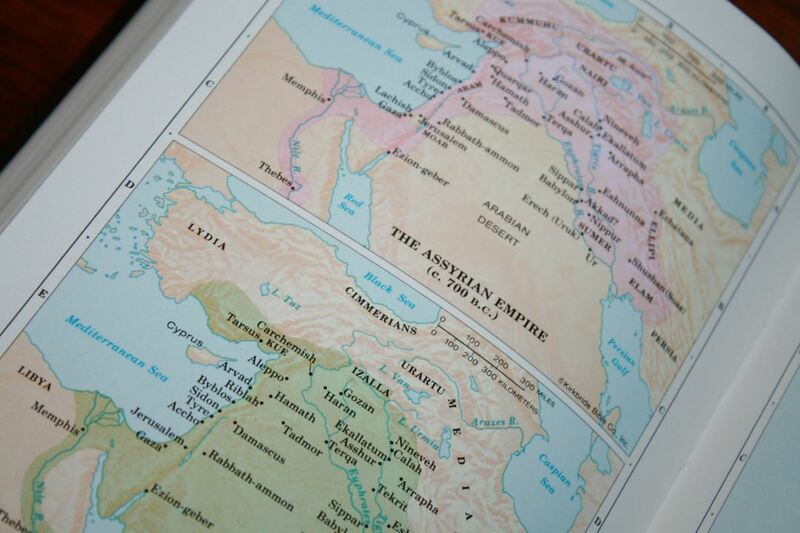 It even teaches the reader to consider the surrounding text rather than just focusing on a single verse. 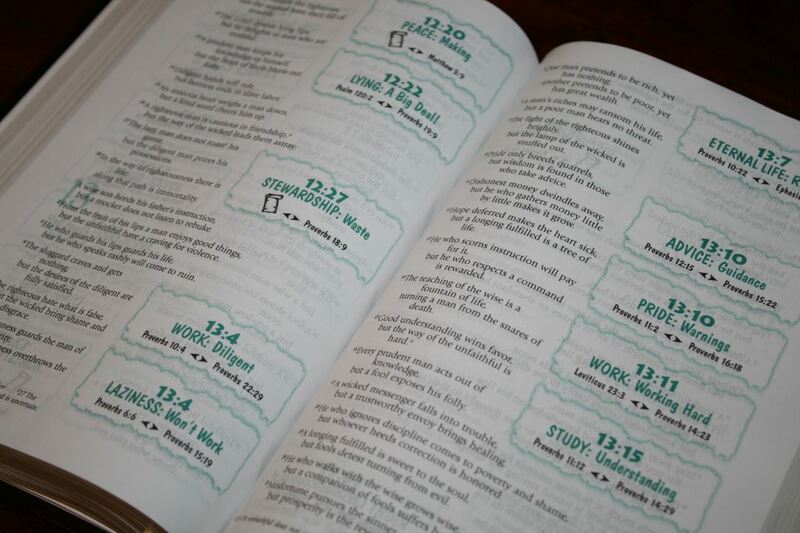 Using Scripture allows the Bible to interpret itself and lets God’s Word teach the reader. 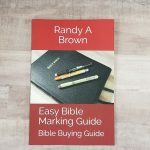 It works great as a guide for families and teachers and children will learn what Scripture has to say without being spoon-fed. 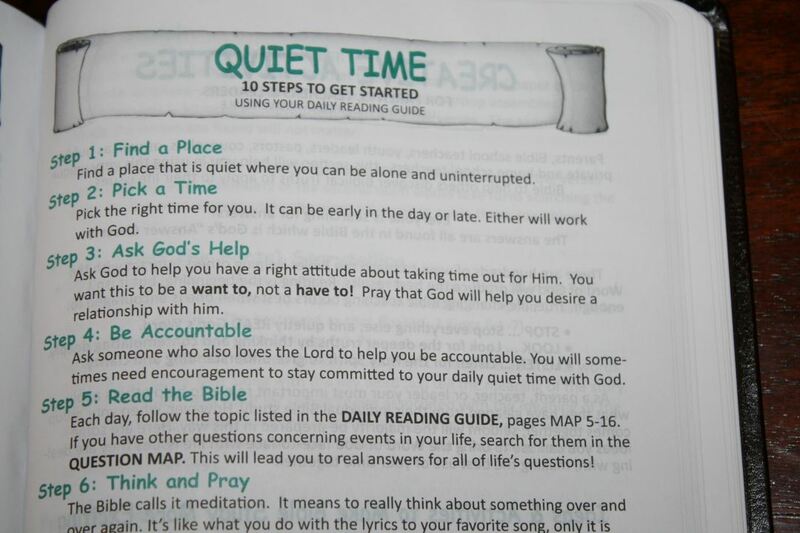 This is help teach them good Bible study habits. 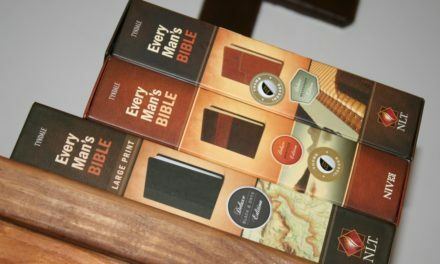 Although it might be a large Bible for the target audience I think the material is appropriate for its audience and I can easily recommend it.